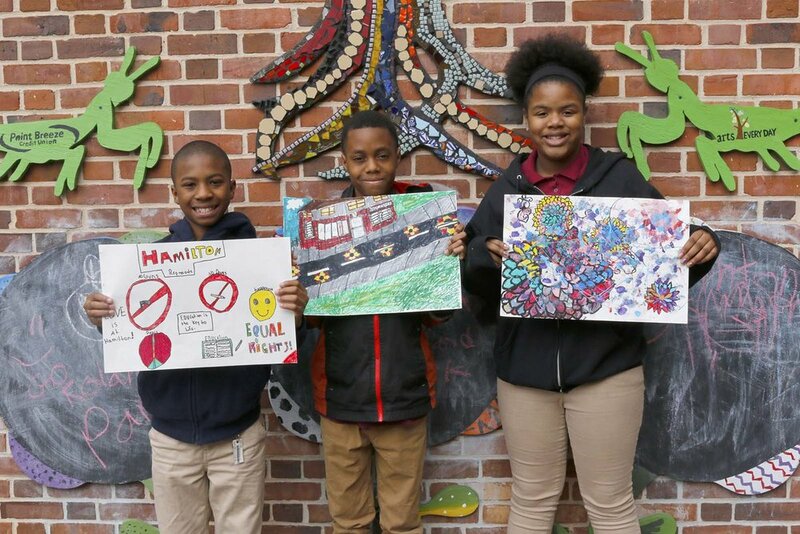 In the fall of 2017 we received a grant to create a piece of public art in partnership with Hamilton Lauraville Main Street for Neighborhood Lights, a co-festival of Light City that is held throughout the neighborhoods of Baltimore March 29th - April 8th. After many discussions, planning and volunteering within the community, we decided to create an ultraviolet-reactive mural that will glow at night. Check out in-process photos below, and a beautiful video done by the amazing Charm City Studios! Special Thanks to Adrienne Hammel for producing all the Neighborhood Lights videos. Presented by T. Rowe Price and coordinated by Baltimore Office for Promotion of the Arts. This project could not have happened without my crew mates, Lindy Swan and Hanna Moran, and my Lighting Designers, Carl Byrne, and his brother, who also lead installation, Steve Byrne. The project coordination team on the neighborhood side was invaluable in getting huge numbers of people involved! Volunteering with Hamilton-Lauraville Main Street, Inc., directed by Regina Lansinger, Mia Blom, Jenny Hamilton, Anne Yastremski, Tiffani Reidy, and Annie Howe, brought together almost 1,000 people to the opening night party featured below. Over the course of two months in March and April, almost 200 neighbors came out to either help paint, help install, run their own parallel art workshop, or assist with the official Neighborhood Lights cyanotype and lightning bug workshop. Check out the video below for more! It was a blast! Through a week-long artist residency coordinated by art teacher Tracy Lyon, students at Harford Day School researched the four layers of the rainforest, completed drawings of their favorite plant or animal and helped us transform them into this beautiful rainforest mural!